Once again, time and making records has got the best of me! I know, incredibly frustrating! All I have to do is sit around all day and listen to ska music and throw it all together for you to listen to once a week! You might be surprised, but I maybe put too much thought into it and too much pressure on myself to make these! So here’s an oldie but a goody, from way back when my only listeners were me, my friends Jen & Marianne and my cats, full of some great great music! 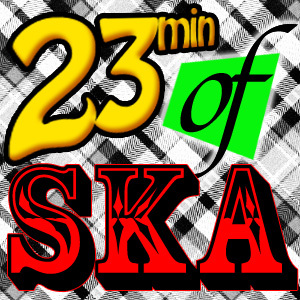 https://radjose.files.wordpress.com/2010/02/23minofska-3.mp3Here we are, another 23 minutes of ska. What’s really been fun with this project is pulling out some CDs that I haven’t listened to in years and rediscovering some old favorites. I hope this has the same effect for some of the listeners and introduces something new to others. And for the last song I couldn’t find my Catch 22 CD so I went with the Streetlight Manifesto version. Catch your copy by downloading it here.